Myelin sheaths insulate the axon of a nerve cell and enable the rapid transmission of impulses. The team that investigated the domain structures of and adhesion between myelin bilayers. From left to right: professor of chemical engineering Jacob Israelachvili; researcher Yair Kaufman; the study's lead author Dong-Woog Lee; and researcher Kai Kristiansen. 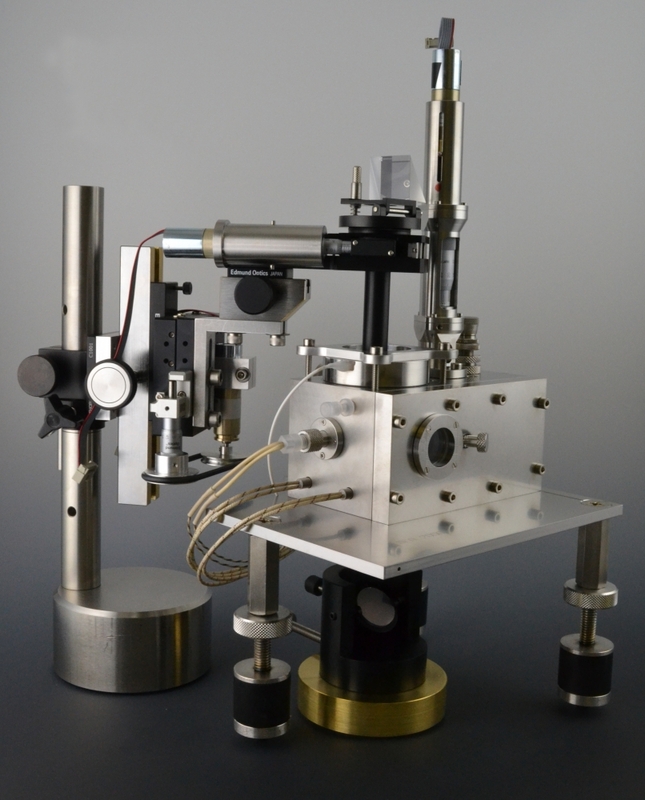 Using the surface forces apparatus and an atomic force microscope, researchers at UC Santa Barbara have taken a molecular approach to myelin membrane interactions, leading to insights into demyelinating diseases, such as multiple sclerosis. Their research is published in the Proceedings of the National Academy of the Sciences. For a healthy nervous system, axons — the long projections of our nerve cells that run throughout our bodies — must be properly insulated. Much like conventional power cords need electrical insulators around the conducting wires for efficient and effective transfer of current, axons rely on multiple bilayers of myelin to maintain a rapid and optimal transfer of impulses between, for instance, brain and organ, or spinal cord and muscle. These bilayers are composed of lipids (fat molecules), protein and water. 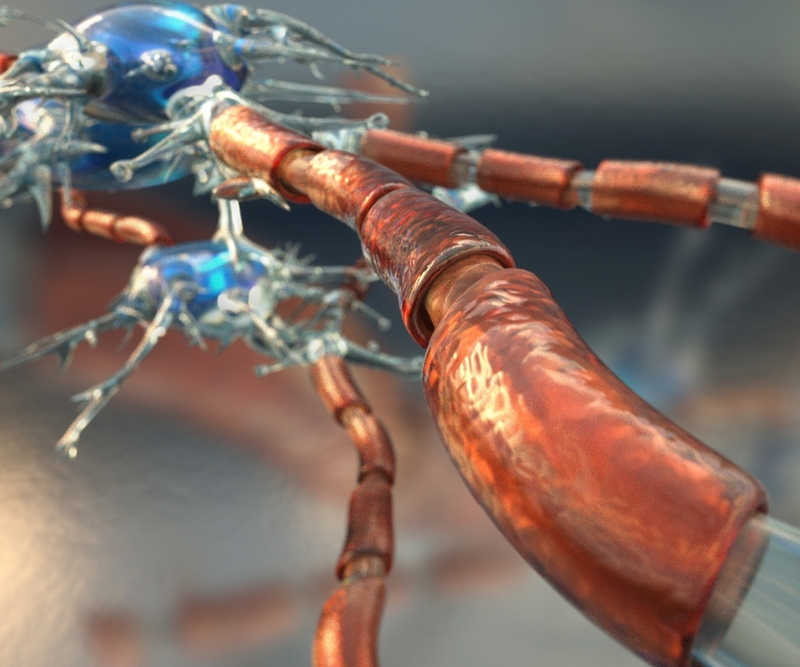 However, even the slightest change in the composition of these myelin bilayers affect their ability to insulate axons, the researchers found. To observe and measure the characteristics and differences between healthy and diseased myelin bilayers, they studied the ability of these layers to adhere to each other. On each of the two opposing surfaces of the surface forces apparatus — a highly sensitive instrument that can measure interactions between membranes — the researchers deposited a lipid bilayer on a mica substrate. Then they immersed the setup in a buffer solution containing myelin basic protein (MBP), a biomolecule commonly found in myelin that gives them adhesive properties and plays a role in maintaining the optimal structure of the myelin sheath. 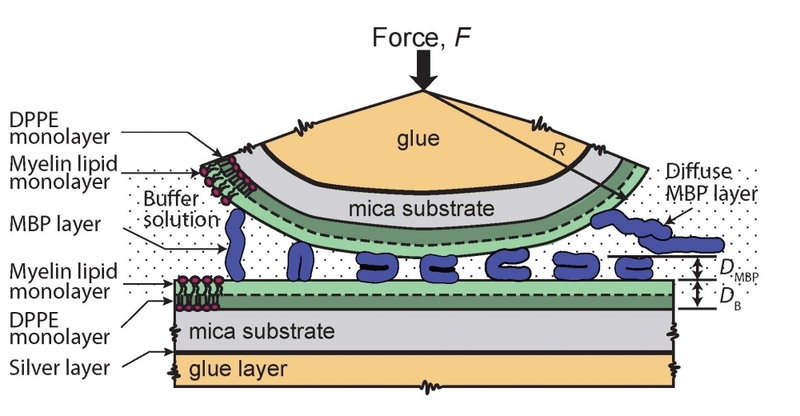 They brought the two bilayers close together, allowing them to stick to each other, and then pulled them apart, measuring the strength of the adhesion brought about by the MBP “glue” between the bilayers, and also the MBP’s adsorption — the ability of the MBP molecules to stick to the bilayers’ surfaces. They performed this experiment with both healthy myelin and with “disease-like” myelin bilayers. One common characteristic of diseased myelin is swelling, due to various causes such as the autoimmune responses associated with MS and its variants, or in cases of infection or exposure to certain chemicals. Genetics also play a role in the health of myelin. “When the disease progresses, people can see that they swell and eventually vesiculate, creating scars,” said Lee. The MBP layer between the lipid bilayers also swells with water that seeps in between the double lipid layers. Instead of being a compact, molecule-thick film, the MBP layer becomes more gel-like. “And since there’s more water between the bilayers, their insulation property decreases,” added Lee. From there, impulses slow down along the axon, or dissipate before they reach their destinations, causing paralysis and loss of function. Disease–related changes in the lipid domain structures’ size and distribution also causes irregular adsorption of MBP onto the lipid bilayers and weakens their adhesion properties. This in turn also leads to lower nerve insulation. This molecular study of healthy and diseased myelin bilayers differs from conventional genetic, cellular or immunological approaches and may provide future insights into causes and mechanisms of demyelinating diseases. The next step, according to Jacob Israelachvili, professor of chemical engineering and of materials at UCSB, is to develop a user-friendly bench-top instrument that could be used in hospitals and clinics to visualize the membranes of certain cells, both healthy and pathological, whose domain structure can be an indicator of the progression of a disease. “We are currently planning a collaboration with a local hospital to provide us with such membranes, for example, from leukemic blood cells, that we would tag with a suitable fluorescent dye to enable this imaging,” he said.